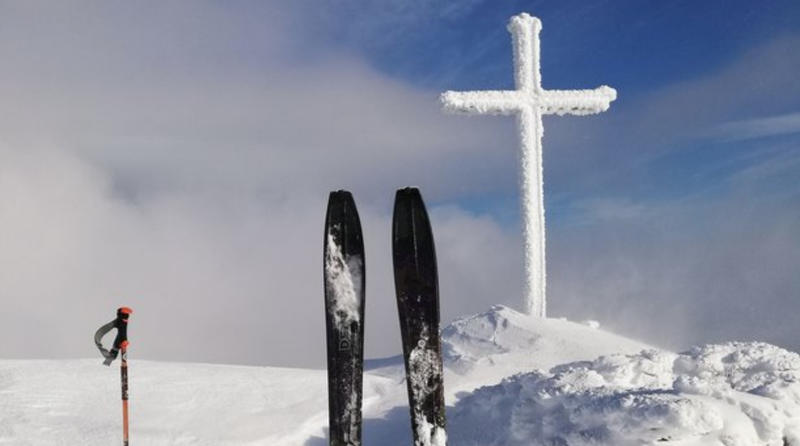 While many of us are cursing the near-freezing temperatures and, in some cases, road-blocking snow, one Irish sailor made the most of the frigid temperatures by completing a descent of the snow-covered Carrauntoohil on skis. World-renowned Irish sailor Damian Foxall, a Volvo Ocean Race winner, took full advantage of the alpine conditions of the MacGillycuddy’s Reeks on Sunday, 3 February 2019, to ski down Ireland’s highest mountain. Damian’s 400m descent brought him from the summit of Carrauntoohil to the top of the Devil’s Ladder. Damian, who has competed in ten round-the-world races which include four first-place wins, said that the conditions for the attempt were ideal. “At 5:30 a.m., with a head torch on, I started the ascent. By sunrise, I had the skis on to climb the final few hundred metres to the cross,” said Damian. “Then the sky cleared, no one was there and there was a clean line of snow all the way down to the top of the Devil’s Ladder. “I took off for my first downhill ski on our highest mountain, avoiding the scree fields, and the ridge edges on a perfect slope. The feeling was unreal and exhilarating – a once in a decade experience,” said Damian.